I haven't ever blogged about liquor stores, but clearly I'm going to have to start. 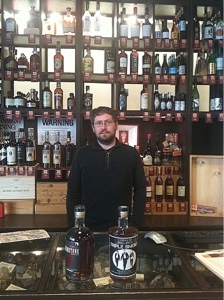 I had been looking for a place in NYC where I could find Balcones Brimstone and Corsair Triple Smoke. After reading an awesome article about NYC liquor stores on The Whisky Woman blog I couldn't resist a trip down to Le Du's Wines at 600 Washington St. in NYC (a couple of blocks up from Houston just east of the Hudson river). I had an unexpected treat when I saw the exquisite jewel-like wall of spirits. Jewel-like a couple of senses: the wall is actually gleaming and beautiful and awesomely lit so the hooch look like cut gemstones; and also the selection is exquisite. The selection isn't big, but it's obvious that someone who really thinks about spirits is carefully selecting every item; cherry picking only the most interesting and the best at each price point to shine in the limited space. The part about price point is important to me - there are inexpensive selections - just the best bang for the buck at those price points (e.g. Rittenhouse Rye 100, plus the rare 25 year old expression; Old Forrester Birthday, and Weller Antique). There is a clear focus on small craft distilleries. Rare and hard to find mid-priced American spirit selections include Tuthill Farms, King's County, Smooth Ambler, High West, Balcones, Corsair, Wasmund's, Willets, Breckenridge and Whistlepig. 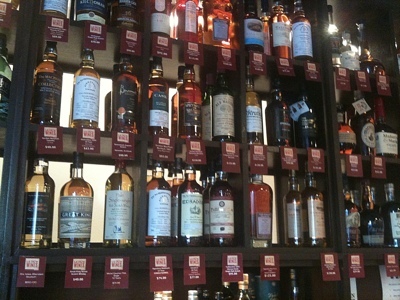 There's an excellent focused collection of Scotch too - with best bang at each price point. This includes some Classic Malts selections but also distilleries like Bruichladdich, and plenty of selections from private labels such as Signatory and Gordon & MacPhail (careful selections here), and Compass Box blends too. At the high end there are rare single single cask offerings from unusual and rare distilleries such as Ben Nevis and Port Ellen. The signature of a clear aesthetic is plainly visible. Wild Turkey 101 didn't rate a spot on the wall, but the Wild Turkey "Tradition" Master Distiller 14 year old tribute expression did. This isn't a conventional liquor store. I had another treat when I ran into JT Robertson - the man behind the jeweler's precision of bottle selection on the wall. He is incredibly knowledgeable, articulate, and opinionated about the world of spirits, the industry, and the flavors. As the conversation progressed he genially poured a wee dram of extraordinary Rittenhouse Rye 25, which I hadn't previously tried. We discussed flavors and I was impressed by his articulate exposition of the flavor profile, "deep plum", "not cherries, more like Kirsch", "the only weakness is the wood becomes a bit astringent at the finish". He nailed it. We had a great moment together. JT talked me into wanting Breckenridge Bourbon but I couldn't swing it at the time - so I'll have to go back. If you are in the Village and want to score some top notch and hard to find hooch I'd heartily recommend a look at the informed selections on the spirit wall at Le Du's. Dude, that's awesome. You are so spoiled having access to stores like that. Though, maybe it's good for me not to have access to that... my cabinet is only so big, and my pocketbook so deep! Yes, NYC is a very very nice town - full of all kinds of access to everything under the Sun. Le Du is dangerous, because it's fun and interesting. The crafted selection makes me feel like I could buy blind there and trust the buyer's tastes. Le Du is a Whisky Woman favorite because it carries those little craft distilleries that are her stock in trade. That also gives me a warm fuzzy feeling. On the down side - it's way way out towards the river. There's a clear wine bias (this looks like a seriously good wine store). The spirit wall isn't that big and the store over all is fairly small (huge by Manhattan standards but small compared to the kinds of stores we have in the burbs). The prices are Manhattan prices too (about 10-15% higher than in the burbs). Le Du stakes its claim by carrying hard to find items - where the small premium is compensated by the fact that they have stock and are in town. It's clearly part of the arsenal. The biggest strike against them personally is that I have Park Avenue Liquors only a few blocks away. That's tough competition for anybody. Still, as good as the NYC metro area is compared to PA, all the US is still the boonies compared to the UK, Belgium, and Netherlands super whisky stores. The US is hampered by the rats nest of blue laws and postal regulations. Depending on your town, county, state etc.. you can't ship, you can't sample, you can't... bla bla bla. Land of the free - except for whisky people.